The consoles are made of cardboard, the female crew members wear shorter skirts than ever, and the familiar theme song segues into swinging 1960s surf rock. Welcome to Turist Ömer Uzay Yolunda, a 1973 Turkish film that boldly rips off numerous elements from the original Star Trek series. That landmark sci-fi show is hurtling toward its 50th anniversary this year, having debuted on NBC in September 1966. 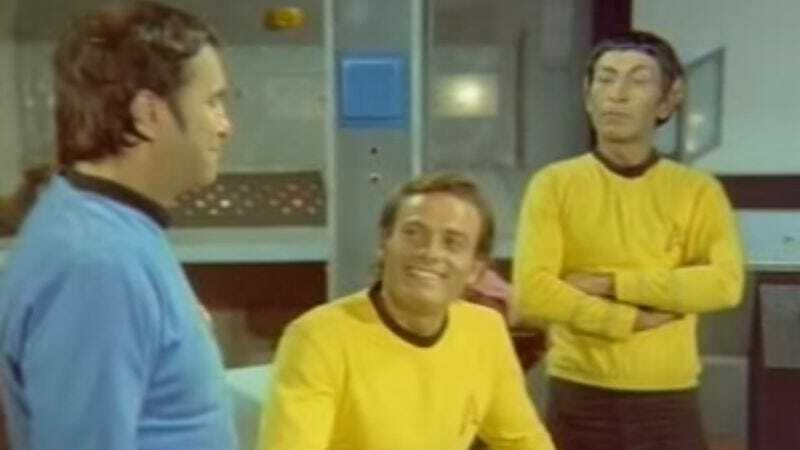 Cancelled after only three low-rated seasons, Star Trek had an afterlife even creator Gene Roddenberry could never have imagined. Not only did it spawn a feature film franchise and several follow-up series, but its reruns have remained in constant circulation both in America and around the world. In fact, Star Trek was one of the most popular series on Turkey’s then-newish television service in the early 1970s. The film, as it happens, actually combines two franchises. The title, Turist Ömer Uzay Yolunda translates as Tourist Ömer In Star Trek. Everyone knows what Star Trek is, but who is this Ömer person? At the time, Turkish character actor Sadri Alışık was making a whole series of comedies as his popular Tourist Ömer character, described by Roberts as “a disreputable fellow with a knack for becoming involved in outlandish scenarios.” In this film, Ömer barely manages to escape a mob-controlled shotgun wedding when he beams aboard the USS Enterprise and encounters the non-union Turkish equivalents of William Shatner and Leonard Nimoy. These tended to be restricted to urban cinemas as the costs involved in screening major imported pictures in rural areas could be prohibitive: it was often cheaper for production companies to make a local version of the latest US hit. Thus was born one of the weirdest sub-sub-genres in all of cinema history. And the world was a richer place for it.